Mention the concept of spirituality around the office and take cover. In that order. So on guard is the average corporate soul against even a whiff of religious partisanship in the workplace that his knee-jerk response is defensive, suspect—even offended. Instinctively, he races to preserve the individual sanctity of church and state, armed for battle before one has even been declared. Spirituality is a concept whose fingertip reach extends well beyond the barbed-wire bounds of organized religion. And while its foundations, for some, are well rooted in formally defined holy doctrine, they could just as likely be planted in the religion of kindness. Or the church of psychic curiosity. Or the idea, in its broadest definition, of simply keeping the faith. 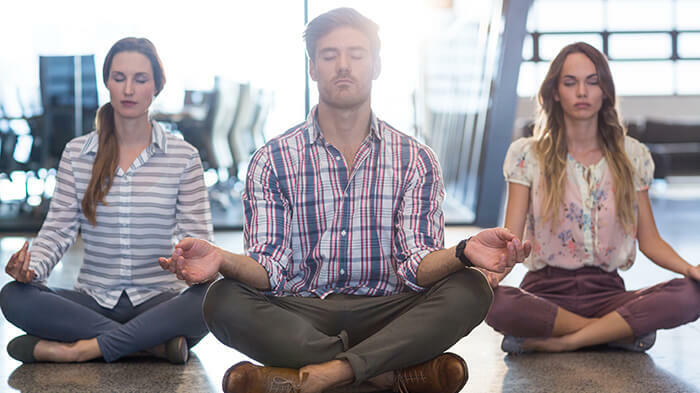 The notion of spirituality in the workplace has only recently been formally addressed, but it’s been observed without lip-service classification since ancient times. It came to the fore as a grassroots movement in the 1990s, with a kind of mass recognition of the importance of spiritual values at work. Five years ago, Businessweek’s cover article asked, “Can spirituality enlighten the bottom line?” And thus, a movement was set in motion. Today, the subject of workplace spirituality is, one might argue, the very backbone of a successful professional existence. A study conducted in 2008 by the Barna Group, a California-based research and resource firm focused on the intersection of faith and culture, reported that 74% of Americans consider faith important, even in spite of their plummeting attendance at traditional houses of worship. What’s more, some 71% said they have their own religious beliefs, although they don’t participate in any religious group. Closer to home, there’s much activity afoot in this realm. There are various organizations dedicated to the subject across the country, and the School of Business Administration at the University of Prince Edward Island recently introduced Canada’s first-ever credit course in spirituality in business. More than that, among the latest crop of fix-all business books find Good Business, a compilation of essays promoting the connection between companies that pay attention to ethical and spiritual details, and success. “Not only should spirituality exist in the workplace, but true progress and prosperity also depend upon it,” shouts the copy promoting the tome. As for the formal realm, various sources report an increase in the provision of chaplain services at the office. In lieu of employee assistance programs or access to therapists, company chaplains have been linked to a decline in absenteeism and a boost in overall productivity. Much speculation has been invested on the origins of the workplace spirituality trend. A grappling response to the end of the job-for-life promise? A group reaction to massive corporate downsizing and increasing globalization? Or simply an expression of the mindset of the population’s biggest bottleneck, as baby boomers work their way through middle age and all of its attendant foundation-shaking questions? In any case, the assumption that the natural impulse to seek direction or meaning at the place which plays host to the great majority of our waking hours is unwelcome is rich, and smacks of unwarranted reactionism. As long as no one’s pushing his god down anyone else’s throat, what’s the problem? Good business practices founded on spiritual bedrock are more relevant than ever, both for the wellbeing of individuals and for the survival of the planet they occupy. And for the folks who freak at the subject’s mere mention, imagining missionary fervor and in-office radicalism, relax. Only good can come of this.